During the early 1840s, the Hawaiian Kingdom sought recognition of its independence among world nations. Britain, France, Russia, and the United States all hoped to gain some control over the Islands, whether through political, economic, or military means. 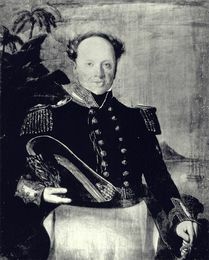 Prompted by the British consul's complaints of harassment of British subjects in Honolulu, Lord George Paulet, captain of the frigate Carysfort, arrived February 10, 1843 and confronted Kamehameha III. To avoid bloodshed, Kamehameha III gave in to Paulet's demands and relinquished the Islands to British rule. Ashamed of Paulet's actions, which contradicted official British policy, Rear-Admiral Richard Thomas, commander-in-chief of the British Pacific Squadron, was sent to restore Hawaiian sovereignty and arrived in Honolulu July 26 from Valparaiso. On July 31 Kamehameha III's sovereignty was returned and the Hawaiian flag was raised again. In a speech of thanksgiving delivered at Kawaiahao Church, Kamehameha III uttered the phrase, "Ua mau ke ea o ka 'aina i ka pono," the life of the land is preserved in righteousness. Today, this is the Hawai'i state motto.